Exploration: DNA is destiny. Human performance can be distilled into numbers and statistics. Newer technologies enable us to read information about our bodies and their performance through devices as quotidian as pedometers and as novel as mail-order genetics tests. To critically examine these interactions and raise questions of how we know ourselves, this project presents artifacts from a not-so-distant world where institutions have put these genetic determinism principles in place. In this design fiction, our futures are written from birth. Does the reassurance of knowing “the future” override the personal disclosures required to understand it? What is required to maintain a crystalized future? What risks are minimized through this approach and what new risks emerge? “Notes from the sea, 2218” imagines a marine ecosystem that has been altered through anthropogenic (originating in human activity) influence. The project advances a perspective of nature as a dynamic and reactive system rather than a static and passive one. Species employ different responses to anthropogenic impact, including behavioral, physiological, and morphological adaptations. Organisms that adapt in ways that allow them to thrive in an altered ecosystem will go on to populate the new environment. This challenges an oversimplified view of humans’ destructive impact on the natural world and their ability to apply technological fixes to repair that impact. 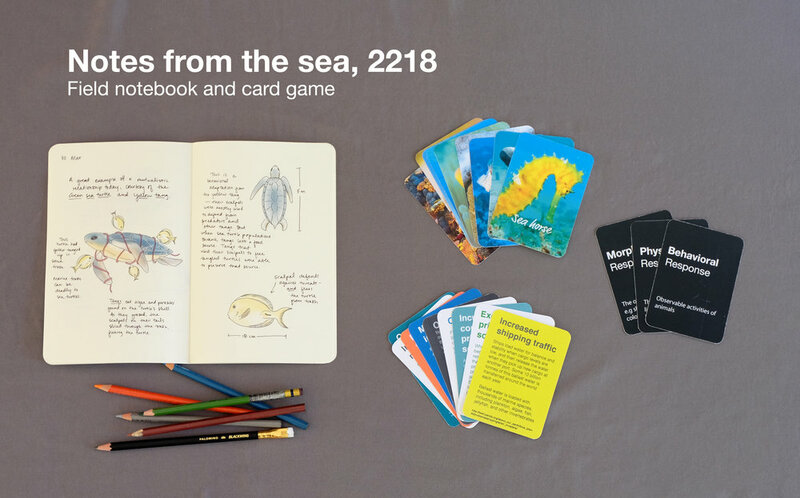 To communicate that perspective, “Notes” employs two tools: a future marine biologist’s field journal introduces the audience to the idea that some species will adapt and even thrive in an altered environment, and a card game invites the audience to participate as a “future biologist” by imagining adapted species and adding them to the field journal. The speculative and participatory design methods employed by “Notes” seek to raise questions, challenge mainstream narratives, and draw out the audience’s own values related to human activity and the environment. The project was presented as a part of a “Designing Futures” showcase, in which participants were able to discuss different non-human-centered futures, unintended design outcomes, and the question of humans’ responsibility to the environment around them. Laura Forlano, a Fulbright award-winning and National Science Foundation funded scholar, is a writer, social scientist, and design researcher. She is an Associate Professor of Design at the Institute of Design and Affiliated Faculty in the College of Architecture at Illinois Institute of Technology where she is Director of the Critical Futures Lab. Forlano’s research is focused on the aesthetics and politics at the intersection between design and emerging technologies. She is co-editor with Marcus Foth, Christine Satchell and Martin Gibbs of From Social Butterfly to Engaged Citizen (MIT Press 2011). She received her Ph.D. in communications from Columbia University.